Badges & Meet The Team Boards. Made from acrylic and f.pvc. With an option to be either pin or magnetic fixing. Branding instantly recognisable by patients and staff alike. Designed to inform and introduce staff to patients and visitors. 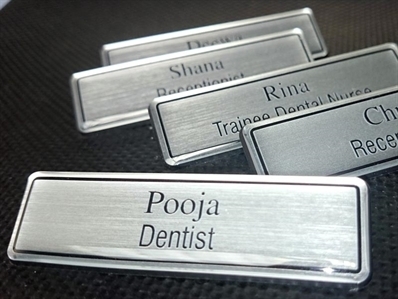 It is really important for patients and visitors to know who they are talking to and personal name badges gives just the right amount of information to safely achieve this. Adding a 'Meet the Team' sign with names and photographs of your practice staff helps to inform patients and to bond staff into a team.